Each and every day of our lives, God is working all around us and through us. Yet, there are some days when things happen that can only be called “God Moments” as there is no other explanation. In February, I received a message from In Touch, which is the ministry of Dr. Charles Stanley. Through that message I made a new friend named Carol and we have been corosponding ever since. She wrote me to see if I could use some “Messengers” which are hand held solar powered devices with Dr. Stanley’s sermons as well as the New Testament. These devices have been shipped all over the world to soldiers as well as missionaries. We scheduled to meet this past Wednesday for me to pick up 17 Messengers. On Monday when I arrived in Atlanta from Uganda, I was standing in the airport customs line to have my passport stamped. Of course everyone who came off the plane was in the line so there were many people waiting. But in front of me and behind me was a group of people which I could tell were a returning mission team because of the things they were talking about. I asked where they were traveling from and they said Uganda. That opened up a great conversation between us and when they learned about the pastors training with Secret Church they asked me if I could use some hand held devices with sermons. What happened next is one of those “God Moments” that I will never forget. They said, “We are from In Touch and the devices are called “Messengers”! A huge smile came across my face and I started laughing….I told them….ummmm I have an appointment already scheduled with Carol for Wednesday morning to pick up 17 Messengers. We all began to understand that God had scheduled this divine appointment because the next thing I knew, they were asking me how many pastors I serve with. When I told them I serve with about 300, they told me that when I came to their offices on Wednesday to meet Carol that they would have 300 Messengers ready for me to take back with me! WOW! Not long after I became a Christian I began to listen to Dr. Stanley’s sermons. For at least 25 years I have held Dr. Stanley in high esteem as his God given wisdom has taught me so many of the life principles that I live by. On Wednesday I was blessed to spend time in their international offices. The staff are amazing men and women who have a heart for getting God’s Word to the world. A great blessing was viewing a world map that shows where In Touch ministries are actively spreading the Word of God. This year In Touch celebrates 35 years of ministry, making an eternal difference in the lives of people all over the world. My next “God Moment” happened today. This morning I had the opportunity to worship in the new worship service at The Venue at my home church, Blackshear Place. At the end of the service at each of the exit doors there were students with baskets filled with bracelets with names of students going to youth camp this week. Although I am going to be traveling and participating in youth camp, I wanted to take two bracelets, one of a girl and one of a boy who I could specifically pray for during the week. After attending the next service in the main sanctuary, I had one of my friends come and share with me about a young lady who would be attending youth camp this week. She shared with me in hopes that I would have an opportunity to talk with this young lady because she believes God is calling her to be a missionary. Riding home from church, I shared with my son and his family about this possible opportunity and how excited I was to know I might have the opportunity to encourage her. Tonight as I went to get the bracelets out to pray for the two students, I looked at the names on the bracelets for the first time. Out of all the hundreds of bracelets in baskets scattered all over the Venue and the main sanctuary, the bracelet I chose had the name of the young lady who I had been thinking about all day today since my friend told me about her this morning. This can only be explained as a “God Moment”! As you can imagine, I’m probably not going to be able to sleep now because I am so excited as God has already shown up and shown off….and we haven’t even got to camp yet! It is a joy to be a part of this amazing week….serving with my church family. Please keep all of us in your prayers throughout this week as we are anticipating many more “God Moments” as the days go by. Thank you so much for all the prayers that have been prayed in the past couple of weeks for Umaru. When I arrived back from Kenya, he was still not in good shape. He was taken to the local hospital to have more fluids drained and returned back to the mission house. But had to go back to the hospital late Saturday evening as he was experiencing some serious changes. He was struggling to breathe and his heart was in trouble. When Mike and Sarah took him to the hospital they didn’t know if his life would last much longer. He was kept in the hospital until yesterday. The hospitals here are not staffed for issues such as these and they have no equipment. They did not even have oxygen for him. They don’t have sheets or blankets much less the critical needs. Yet, during his stay he began to stabilize and was sent home yesterday afternoon. We were so happy to have him back home and were looking forward to him having some good days. But, during the night he once again took a turn for the worse. I don’t know enough about the medical to describe what was happening, but I can say that he was suffering terribly. We brought him to my room and put him in my extra bed and we gathered around him not knowing what to do, but pray and just be with him. So thankful we have Mike here who as a paramedic knows so much about medical things. Also thankful for Dr. Brad Pierce being available via phone. He first treated Umaru when he was here on a medical trip last year. Umaru was a random child among those he treated that week, yet here we are a year later and he is available for Umaru once again. Dr. Brenda is in Honduras this week on a medical mission trip, so we are thankful for Dr. Brad stepping in to help. It took some time, but eventually the medicine began to help. His pain decreased and he finally went to sleep. Over the following 6 hours he slept and when he woke up he was doing much better. I know he is doing better because people are praying for him. When he woke up I had some boiled eggs ready for him and he ate 3!!! He seems to be much better and we are giving God all the glory! We do not know what Gods plans are, as the diagnosis still remains that his time here on this earth is short. Yet, we know God is in control and we are surrendered to His plan, His will and His way. 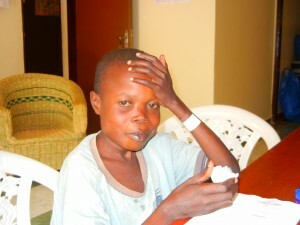 Mike and Sarah had to talk to Umaru’s mother yesterday and explain his diagnosis. As you can imagine, she is devastated. Our concern is her turning back to the cultures here and her thinking about taking him to a witch doctor. 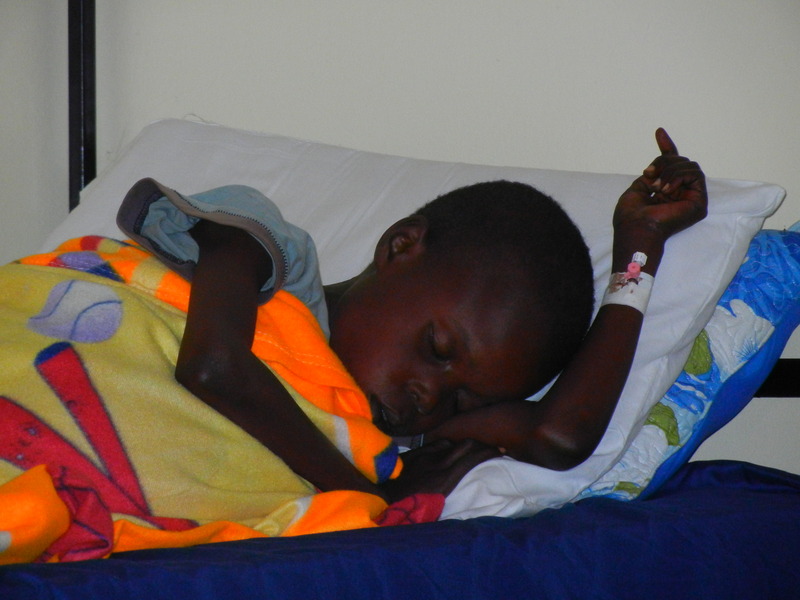 She has continued to believe that Umaru is sick because he has been bewitched. Pray that through this her faith in God will increase and she will put away the things of this world that were part of her life before she met Jesus a couple of months ago. Today Pastor Joseph who helps us when we have children with critical illnesses came and spent time with her; giving her spiritual guidance and encouragement. Please pray for her as she wants to help her child and in so doing is considering practices that would bring him great harm. Please pray for us as we pour Gods love out to them and hold them up during this time. Pray for Mike as he oversees Umaru’s medical care. Also, another prayer request that pales in comparison to Umaru is for us to regain power and water. Today is day 7 with no power and day 3 with no water. The Life and Mission of Joy Breedlove is powered by	WordPress 3.4.2 and delivered to you in 0.142 seconds using 38 queries.